We are fast approaching the end of the wine and cheese pairings on our original list. Luckily we found another list this week to continue on with. The cheese this week was supposed to be Camembert which I have never seen or tried so it made for an interesting search. After trying 2 different stores I came home and looked online to find out some characteristics of this cheese. I learned that Camembert is very similar to Brie except it comes from a different part of France. With this information in mind I went to my third store on a quest for cheese. The cheese I found was French and it looked like Brie but it wasn’t Camembert. I figured we could give this one a try since it was the Trader Joe’s cheese of the month. cherry without being overly spicy. What hit us first about the cheese was the smell. It was definitely a stinky cheese! Despite this initial reaction we kept open minds and gave it a taste. What are your thoughts on stinky cheeses? Yay or nay? If you are a fan, click the link to the left to give this one a try. 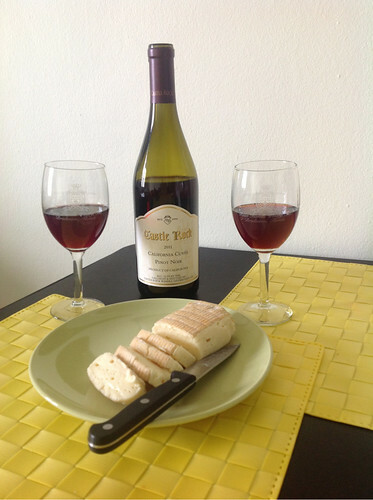 Neil felt the wine made the cheese more pungent, and that it was aged but flavorful. Maria couldn’t get past the smell because it reminded her of a barnyard! The cheese was strong, and the cheese flavor was magnified for her after the wine. Unfortunately this was our least favorite pairing. The cheese was too pungent and the wine was not memorable. Oh well, they can’t all be winners. Better luck next week!